The Jason-1 ocean-observing satellite has been in orbit for 10 years. In that time, it has helped to build up a 20-year time series of continuous sea-surface measurements to enhance our understanding of climate change. How Jason-1 works. Credits: NASA/JPL. Developed jointly by CNES and NASA, like its predecessor TOPEX/Poseidon, Jason-1 has helped to build up a 20-year time series of continuous sea-surface measurements. “Such continuity is important because the oceans play a key role in regulating Earth’s climate,” explains Juliette Lambin, in charge of oceanography programmes at CNES. Oceans cover 70% of Earth’s surface and contain 96% of the planet’s liquid water. “Satellite observations have enabled us to establish global ocean forecasts in near-real time,” she adds. Measurements of surface temperature, winds, mean wave height and ocean currents enable scientists to precisely study how oceans and climate are related. The measured rise in mean sea level has been underlined by the IPCC* as evidence of climate change. And real-time monitoring of phenomena like El Niño and the Gulf Stream has improved our understanding of how they affect climate. 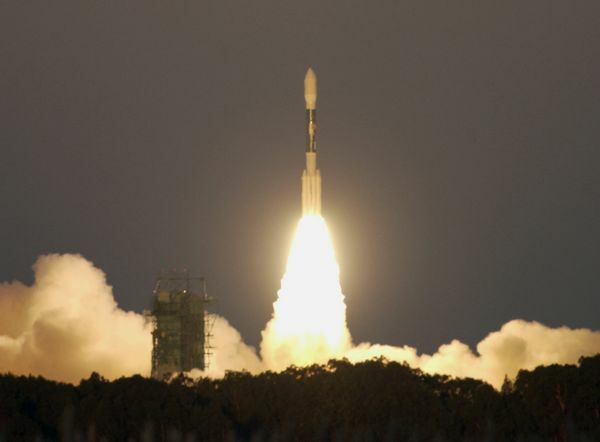 Jason-1 lifts off on 7 December 2001 from Vandenberg Air Force Base, California, atop a U.S. Delta II launcher. Credits: NASA/JPL. Jason-1, built around a CNES Proteus spacecraft bus, is carrying a main instrument—the Poseidon-2 altimeter supplied by CNES—and 3 ultra-precise positioning instruments. These include DORIS, also supplied by CNES. “Because it was calibrated using its predecessor TOPEX/Poseidon, Jason-1 was able to provide highly accurate data right from the word go,” says Juliette Lambin. Combined with data from Jason-2, in orbit since 2008, this information is very reliable. Launched in December 2001 for a 5-year mission, Jason-1 has now doubled its initial design life. Orbiting at an altitude of 1,340 km, it is too high to be disposed of by re-entry into Earth’s atmosphere. Its orbit will therefore soon be lowered a few kilometres to avoid any risk of colliding with its successors. And in 2014, Jason-3 will join Jason-2 in orbit. Jason-1 and Jason-2 data are processed and disseminated by the SALP altimetry and precise positioning department and available on the AVISO website.